JOHN FROST was married in Deal and brought up his family there, but was not baptised there. His age at his burial is given as 31. This would mean he was born in 1774-5. The Frosts arrived in Deal from Sandwich in the 1760s. John Frost married Sarah Tomlyn there in 1767. From 1769-1772 there were baptisms in Deal for their children. They were the only Frost family in Deal at that time. They then moved to Dover. John was born on 31 Dec 1774 and baptised on 15 Jan 1775 at St James, Dover. He was the fourth of eight children. When he was five, the family moved for the last time. The two youngest children were born in Charlton by Dover, just north of the port. John moved to Deal, where his older siblings had been born. He was “of this parish” when he married there in 1796. A John Frost, who may be his son or nephew, became a mariner. We have no evidence yet whether John was a boatman too. So far, only two other Frost boatmen have been found in the nineteenth century. The surname Frost occurs only once in The Last of Our Luggers, E.C. Pain’s book about the Deal boatmen. There was a famous boatman called Henry Frost Spears, 1819-1894. He could well be part of this family through his mother or grandmother. LUCY SPINNER. Lucy was the daughter of John Spinner and Sarah Petley. She was baptised on 24 May 1772 in the parish church of Deal. She was the seventh of ten children. Their marriage took place in 1796, in the reign of George III. This was the time of the French Revolutionary Wars, when the south-east coastal ports were very aware of the possibility of French invasion. Both were “of this parish”. Witnesses; Win ?aley, George Foreman. George Foreman witnesses many marriages, and may have been the sexton. Their first child was baptised only five months later. There are two more children for them in the St Leonard’s baptismal register, which includes those carried out at St George’s chapel in Lower Deal. It was quite common to use the mother’s maiden name as a second baptismal name. When Sarah was 9, John junior 7 and Richard 5, John senior died. Two years later, a terrible storm struck Deal. 1808 Jan 15. This day the wind continued with increased violence, and brought in a most tremendous sea, which at one time even threatened the destruction of the town. The foundations of a great many houses next the sea have been undermined, store-houses have been swept away with their contents, and the ground tier of dwelling-houses filled with water. The seas during the tempest made a considerable breach between Sandown Castle and the Battery Wall, which has inundated the chambers and forced such a torrent of water into the lower streets of Deal that the cellars have been completely filled and property to a large amount totally destroyed. In a row of houses adjacent to Alfred Square the torrent was so deep that boats were obliged to be got down and the miserable inhabitants taken out of their houses by the chamber windows. Several quays in Broad Street which had braved the fury of the elements for a series of years, have been totally destroyed and the timber washed out to sea. After John’s early death, Lucy must have struggled to bring up the children alone. She died herself at the age of 46 in the Poor House. She may have been forced to take the children into the Poor House before this. 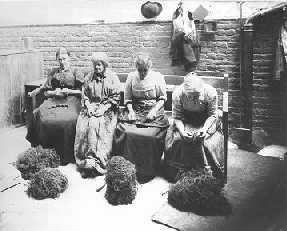 Rules varied from workhouse to workhouse, but it was common for husbands to be separated from wives and parents from children. If she took the children there, she may only have seen them at the weekend. Deal, which had 116 inmates in 1772 was one of the larger poorhouses in Kent. When small village poorhouses were amalgated into Unions, Deal remained unaffected. KFHS microfiches of Deal registers. John Laker, History of Deal. T.F.Pain & Sons, Deal, 1917, p.334.